Finished the front side layups on F22 this week, but unfortunately when removing the peel-ply it grabbed a single bundle of fibres on the top layer of UNI and pulled it up with it (I didn't trim until after cure). 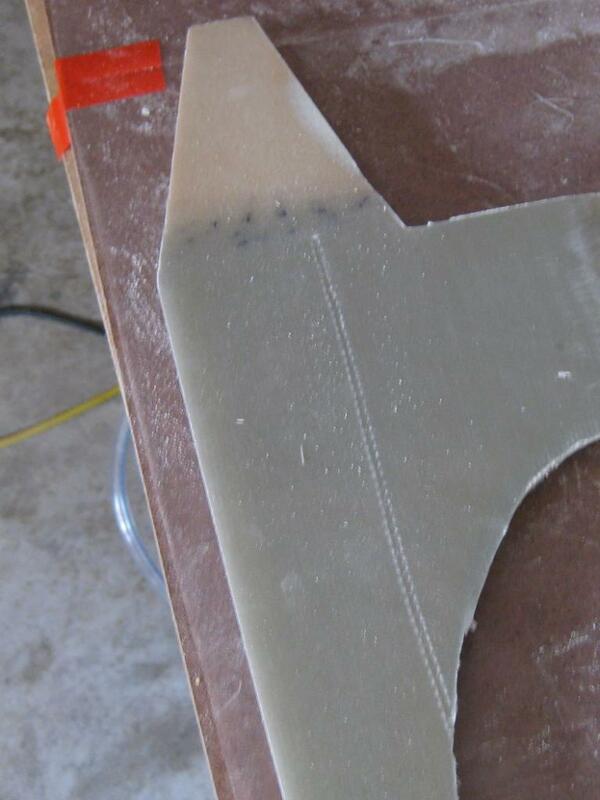 To my newbie thinking, rather than do the 'standard repair' and have a lump here which appears could be a big pain when it comes to canard install, I could just replace the missing fibres into the groove, wet-out, peel-ply and squeegee flat through plastic. The loss of strength here should be minimal if I'm understanding correctly, but I would like some feedback, given that this is a particularly important area! I wouldn't bother about it. You have at least nine layers of BID and UNI in that area so losing a few threads is not going to matter, except cosmetically. It that the forward face of F-22? Later you will be taping nearby to join it to the fuselage and adding a pad of BID there to make a surface for the canard lift tabs so there's plenty of glass to go. It's a little concerning, though, that the UNI ripped off so easily. Usually it sticks pretty well. Maybe it was just not fully cured. Thanks Kent. It is the forward face, yes. It was cured hard, but not yet full-strength. Easier to remove the glass...er... peel-ply that way. I wouldn't bother about it. I believe the UNI is in the wrong orientation and F-22 needs to be redone. I read it again and i think it is OK. The UNI in the alternating UNI and BID plys run vertical. It makes sense for the loads. Yes, we were confused, these are the extra plies on the sides of the fwd face of F22, not the horizontal plies right across the top, so no real problem. I'll just add this to my list of oaf stories when I get by site going. Alongside how difficult it is to sand micro filler that's actually microsphere blend (ie mixed with colloidal silica). Ha, but the point I think you're also aware of is to let the part fully cure before removing the peel ply. Looks good. If I were paranoid without anyone to consult I might add two more uni plies on both sides, but filling with flox (and using more peel ply) will be fine as Ken, and now Marc, suggest. Yes indeed, I have learned quite a bit since starting chapter 4, despite having done quite a few 'practice' parts for other uses prior to building my first flightworthy parts. Most of those parts were made with West which cures much more quickly and at lower temps than the epoxy I am using now, so there's some gotchas there.